The Sunshine State, with beautiful beaches, tropical rainforests, vast deserts and bustling seaside resorts. Showing Brisbane, Surfers Paradise, Gold Coast, the east coast islands, Far North Coast, Cairns, Rockhampton, Mt Isa and the Outback. 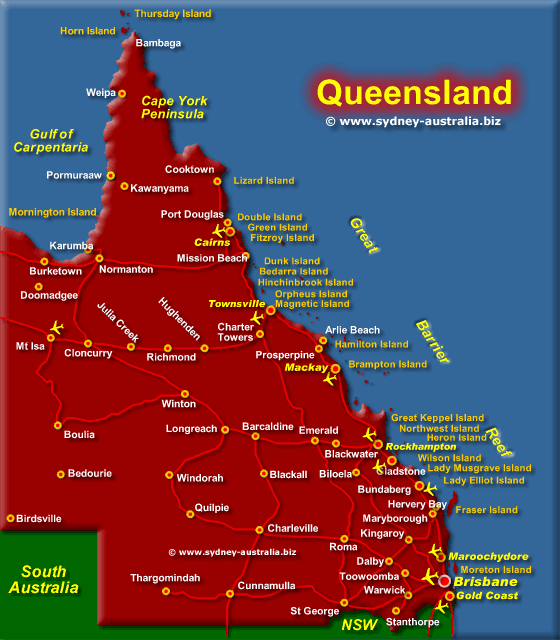 See more about Queensland Travel - Brisbane, Surfers Paradise, Maps and More. Finding jobs, work and employment Work in Australia - Jobs. See more about the State of NSW New South Wales. See more about The Northern Territory. Queensland accommodation includes hotels, motels, luxury resorts on islands, beaches and mountains, caravan parks, camping, bed and breakfasts and farm stays.